The peak of the flu season could still be several weeks away, federal health officials cautioned Friday. 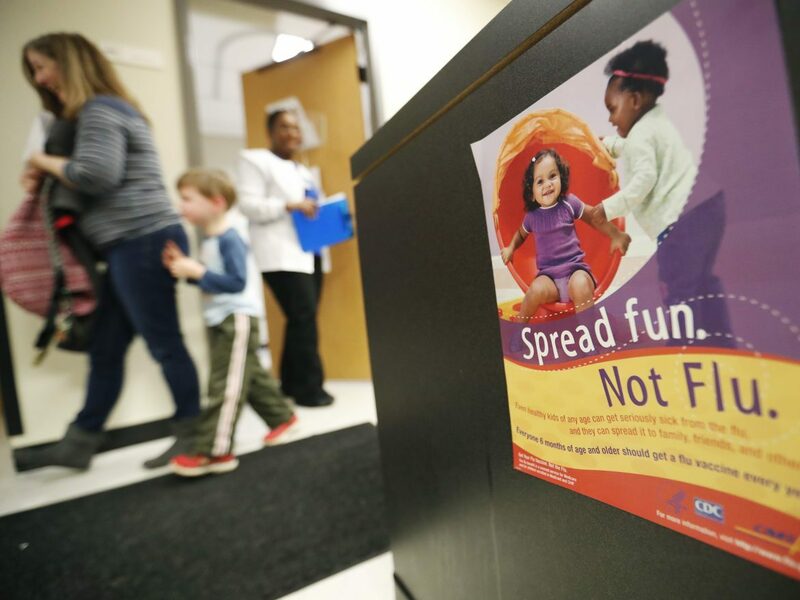 “We may be on track to break some recent records,” said Dr. Anne Schuchat, acting director of the Centers for Disease Control and Prevention. Nearly all states are still reporting widespread flu activity, with less severe reports only coming from Oregon and Hawaii. Health officials don’t directly count flu cases and deaths for the general population. They do track deaths among children, which climbed to a total of 63 for this season. Another measure is the percentage of deaths attributed to flu or pneumonia, which often accompanies influenza. Last week, 1 in 10 of all deaths reported in the United States were caused by flu or pneumonia. The rate of flu activity is similar to the rate in 2009, which was the last flu pandemic, “though that doesn’t mean we’re having a pandemic,” Schuchat said. The strain of flu known as H3N2 remains the dominant form circulating in the United States. It’s a particularly severe strain that isn’t easily stopped by the current vaccine. Two other strains are on the rise, however, and they generally cause milder symptoms. They’re also more likely to be blocked by the flu vaccine. So, Schuchat said, it’s still not too late to get vaccinated. The CDC recommends antiviral medications, such as Tamiflu or the generic version called oseltamivir, for vulnerable populations hit by flu. Those groups include young children, pregnant women, the elderly and people with heart or lung disease. There are spot shortages of the antiviral drugs, Schuchat said. People seeking them may need to call multiple pharmacies to fill their prescriptions. The CDC has been working with insurers and pharmacies to alleviate those shortages and to make brand-name drugs available at a lower cost when generics aren’t available. “I wish there were better news this week,” Schuchat said.